I am constantly fascinated by the vocal repertoire of crows. They produce over 20 calls, but I would venture a guess that for most people (I being one of them) the vast majority of those sounds are too subtle to distinguish between. As I hear it, there are four majors “classes” of call that are easy to differentiate, even for a completely novice birder. Those are: The classic ‘caw’, the harsh ‘scold’, the female courting ‘rattle/knock’ call, and the juvenile begging sound. To make up the rest of the over 20 sounds, they use a combo of caws, clicks, coos, grunts and rattles. While more has been decoded than I offer here, there is still much that remains a mystery. Take for example their scold call. 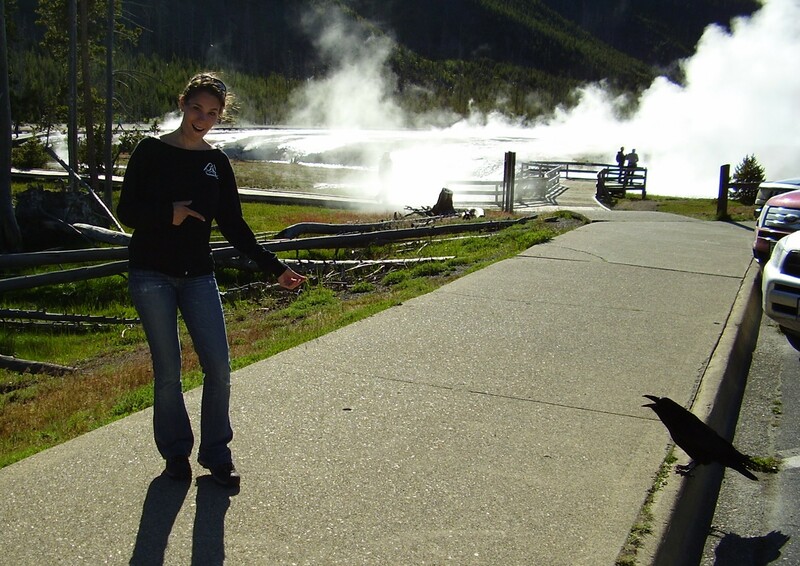 Me, getting yelled at by a raven in Yellowstone that wanted a treat NOW! Stimulus days featuring either our dead crow or our dead crow+the hawk consistently draw the largest number of birds. In fact based on last year’s data, the dead crow+hawk stimulus draws the greatest numbers of birds by a large margin. That’s not a huge surprise since hawks are a primary predator and responding very strongly to an obvious kill would provide a safety mechanism to the ‘neighborhood’. Needless to say, with few exception once the first bird comes across this scene it alarm calls (scolds) and either very quickly or over a few minutes will draw a crowd of 10-30 birds. It can certainly be more or less but somewhere in that range is most typical in my experience. Now, none of this is particularly interesting. What’s interesting is what happens the next day. As a reminder, all our stimulus trials feature one of the known dangers paired with a person. In the case of the dead crow+hawk this person is standing 2m away from the stuffed birds. In half my trials I send this person out the next day and in the other half they get sent out a week later. This is to test for any “guilty by association” inferences the birds are making about these people simply because they were near a known threat. To my elation I’ve found that many birds do indeed respond to these people when they see them in the future. While that’s certainly cool in and of itself, what makes it interesting from the perspective of their calls is that although their alarm call in this instance does not sound different to me, they almost never draw the crowds the initial stimulus day does. It’s almost as if the hawk or dead crow is a neighborhood problem but a dangerous person is only the territory holder’s problem. Is the caller advertising this distinction and intentionally not drawing in the other birds or are the others making that choice themselves? I have no idea. But there’s no arguing that there’s a level of complexity there worth investigating. As for the story on my Jaws loving bird. This afternoon I was returning to a field site I had, just the previous day, tested the stimulus I described above on. While I was walking through the woods on my way there I noticed a shadow occasionally passing above me. Finally I saw my stalker: A crow who I can only assume had spotted me and was hoping I’d offer some food before we actually arrived at the now tainted feeding site. Once we arrived I threw my food out and, unsurprisingly, was not greeted by eager feeding. Instead the bird merely perched in the tree and stared wishfully at the food it was too nervous to eat. After a few minutes I started to hear an inexplicable noise. A very low duh-nuh. Duh-nuh. The field site is located on the edge of a residential street and at first I assumed it was some kids, maybe just playing or perhaps intentionally trying to mess with me. It was clearly the intro to the Jaws theme song. But the more I listened, I realized there were no kids around and the sound was coming from the wrong direction to be made my a person. With some careful watching I realized that, although I could not perceive it to be moving its bill, my perching crow bowed its head in perfect unison with the sound. It became clear it was the sound’s author. In all my time watching these birds I have never heard anything like it. Have you? You can listen to it here, but be warned it’s pretty quiet so turn your sound up. I just heard a crow making the “dun-nuh” sound! I’d never heard it before so tried to google to see if anyone knew what it meant (transcribing bird sounds is hard!) and found this post. I’d have put this one closer to “mnh-hmm” but it was very similar to the sound in your video. Interestingly it was a crow that I’ve fed on occasion, in the same spot outside where I take my lunch breaks. I suspect it recognizes me as it will often swoop down to the ground and hangout near by me for awhile, likely hoping for another handout. This time it landed nearby and shortly began making that sound, head down, then two beak clicks right after. It would then walk a few steps parallel to me and repeat exactly the same sound and clicks. Went on for about a minute until it took off again. Very weird as its such a quiet sound, barely louder then humming to yourself. It wasn’t loud enough to be heard by other birds or animals, so it was either doing it for its own benefit or mine. Hi, very interesting read. I grew up in California an spent many hours watching and listening the crows. In the high mountains they will sometimes use very low clicks spaced apart. The sound bounces around the canyons as their dropping animal bones or nuts to brake open often stolen in mid air by another. My theory is it’s a low grade echolocation and when directed at another living creature can also detect heart rate to interpret intent or see how his lady is doing. Just a theory though. They are a few I’ve seen that mimic human sound. Very awesome.